Schoellhorn-Albrecht designs and manufactures cleat chocks in a wide variety of sizes and styles. 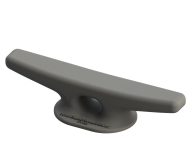 Ranging from 12" to 48" sizes, as well as a thru-the-deck option, we have the cleat chock to match your vessel needs. Our deck fittings are used by barges, military ships, and industrial ships, operating effectively throughout the world.